On Good Friday 2014, Kate visited Sydney during her royal tour of Australia. 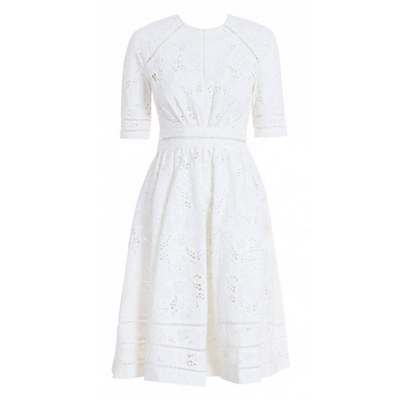 She wore a white Broderie Anglaise dress by local designer Zimmermann. Specifically, Kate wore their “Roamer Day Dress”. 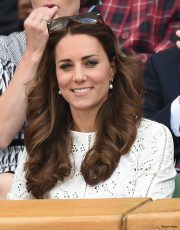 Zimmermann’s white ‘Roamer’ dress was worn by the Duchess of Cambridge on her tour of the label’s native Australia. Crafted from breathable broderie anglaise cotton, this feminine style is cut in a flattering 1950s-inspired silhouette. Wear yours with a slip. The dress features broderie Anglaise eyelet detailing throughout, open detailed stitching on waistline, sleeves and dress hem. The dress features elbow-length sleeves and a knee-length hem. When Kate wore the dress in Australia, Zimmerman’s website crashed due to excess traffic load on the servers! Kate later wore the dress to Wimbledon in June 2014. Sadly, Zimmermann no longer sells the Roamer Day Dress. However, they did release the very similar “Roza” dress as part of their Summer Swim 2017 collection. It’s now available EXCLUSIVELY at Matches Fashion. 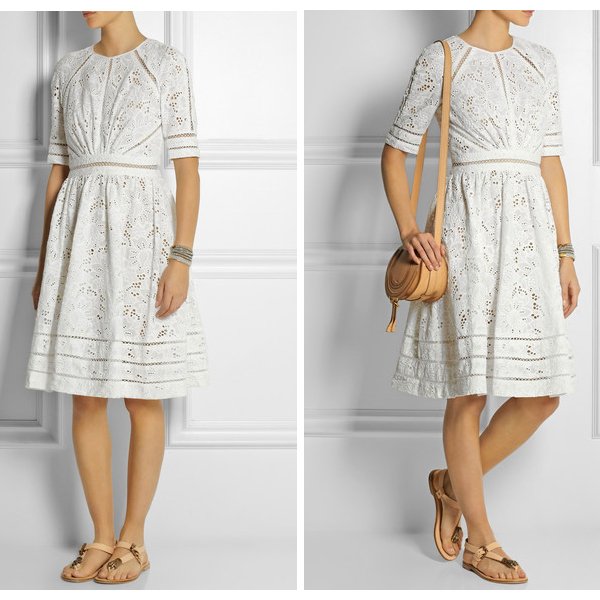 Zimmermann’s ivory broderie anglaise Roza dress is perfect for both vacation and summer days in the city. It’s cut from a cotton and silk-blend for a flattering fit-and-flare silhouette, and is prettily decorated with geometric flower embroidery and circle-insert trims. Try it with classic tan accents. DID YOU KNOW: Actress Naomi Watts was also spotted wearing the Roamer Day Dress in March 2014? Zimmermann is a well established Australian fashion label, it was set up 23 years ago by sisters Nicky and Simon who continue to run the company today. Zimmermann is renowned for their swim and resort wear.